Last summer, I had the humbling privilege of meeting with a group of approximately 20 adult "children of hoarders" at the Dante House, with our host, Dr. Suzanne Chabaud. Dr. Chabaud was preparing to open her online survey of adult children from hoarded homes, and this group came together to share commonalities, offer support, and to become empowered to make change for others like us, especially those children who might still be living in a hoarded home. One of my colleagues, Momma B, as I call her, has been writing for years as a way to move through the chaos of her childhood. Her blog is on my list over there <--------. 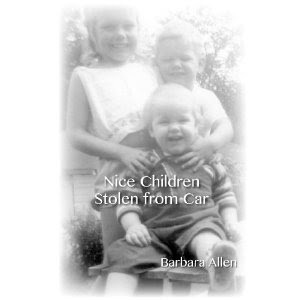 But just recently, her book by the same name, Nice Children Stolen From Car, became available for purchase.